In Cayo district there are several options, ranging from jungle tents to luxury. We ended up choosing the Chaa Creek Lodge as a base to explore this part of the country, as they offered both jungle experience and comfort. There are so many things to do at Chaa Creek Lodge, you might never want to leave! Most people that go to Belize flock to the islands along the coast, but we were looking the most forward to Cayo District. The Cayo District has so much to offer the adventurous traveller: cave tubing, horseback riding, Maya temples and so much more. The weird thing is, that you wouldn’t notice it when driving on the one big road crossing the country from West to East. But there are many gems hidden on every turn off the road. To get to Chaa Creek, you drive through a country like setting, eventually arriving in a garden oasis. Tranquility, birds and lots of wildlife. The grounds are meticulously maintained but it keeps its jungle charm. You are in the jungle, but it feels like you are ‘safe’. Their tagline ‘Wildy Civilised’ matches just perfectly. 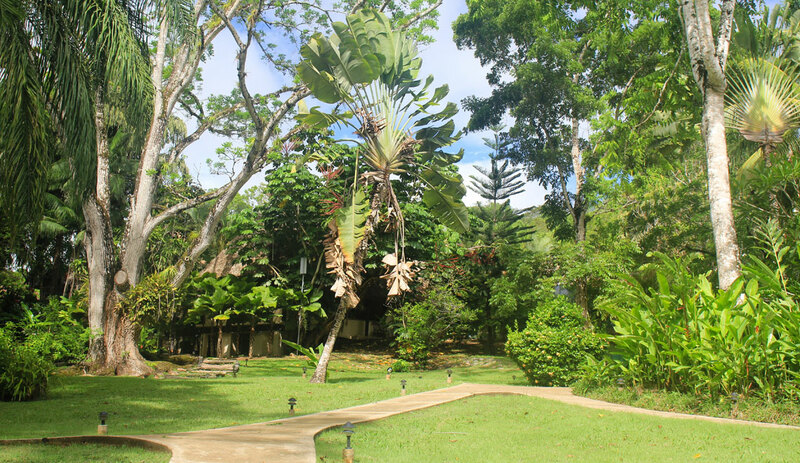 The eco-resort is set up near the Macal River. We booked the cottage collection for the first 3 nights. All the spacious palm thatched cottages blend in with the jungle surroundings. Each cottage is individually designed and charming. Our private veranda was perfect for viewing wildlife and lots of birds. The resort is home to a large part of the wildlife Belize has to offer and you are right in the middle of it. We booked the Treetop Suite for our last night to celebrate our 1 year anniversary as a married couple. The suites are so romantic and a one-of-a-kind jungle experience. The suite has a birds’ eye panoramic view and just a stone throw away from the Macal River. A small group of howler monkeys actually decided to camp for the night in the tree next to us. It was such a pretty sight during the day. And early in the morning, they were the ones to wake us up. This has been the best experience ever; you feel one with nature. The resorts cater travellers looking for a physical and intellectual challenge. With a wide range of tours and activities, there will be something that will interest you. The Lodge even offers you several tours complimentary on-site. The staff here makes you feel at home and special. They are extremely friendly, proud to be there and to show guest all the wonders and flavours of the country and the resort. This is what we did during our memorable stay at Chaa Creek. The best tour and a must-do when you stay in Cayo: the ATM tour! (sorry, no photography allowed on the tour) The cave Actun Tunichil Muknal (which is Mayan for Cave of the Crystal Sepulcher) is about 1,5-hour drive from Chaa Creek. You will hike for another 45 minutes through the jungle and you have to cross 3 stream crossings before entering the cave. A cave where they actually performed human sacrifices. This Indiana Jones kind of adventure is challenging; you need to be able to swim and climb on the rocks. The reward is seeing the ceremonial chamber where the remains of the ancient Mayas were found. You will see the real skeletons, ceramics, and stoneware. It’s like nothing I have ever done. You will stay about 3 to 4 hours inside the cave. It’s full day tour. We were so impressed and also physically tired of the day so we just checked into our room and waited for dinner. 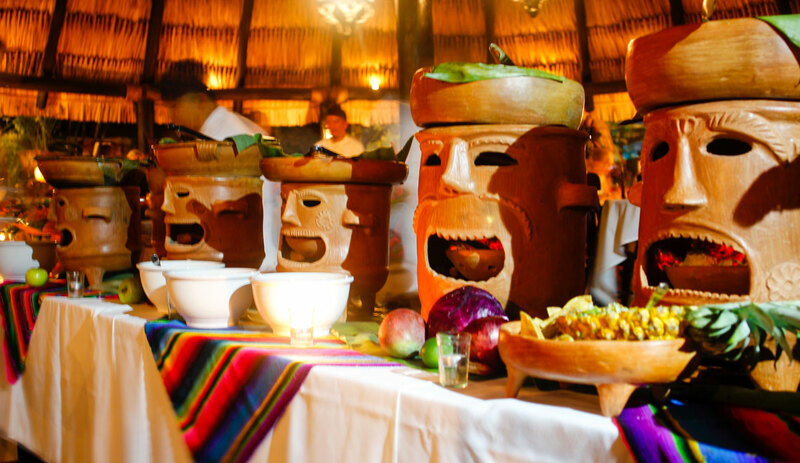 We got a surprise as the restaurant featured a Mayan buffet. Mayan food is my new favourite! It was incredible. We started our day early with the Bird Watching Tour. The resorts’ 365 private acre nature reserve might be one of the better places of Belize for bird watching. Over 300 species of birds can be found here throughout the year. Professional birder Meshack was truly excited when another bird popped up and he is knowledgeable about every single one. 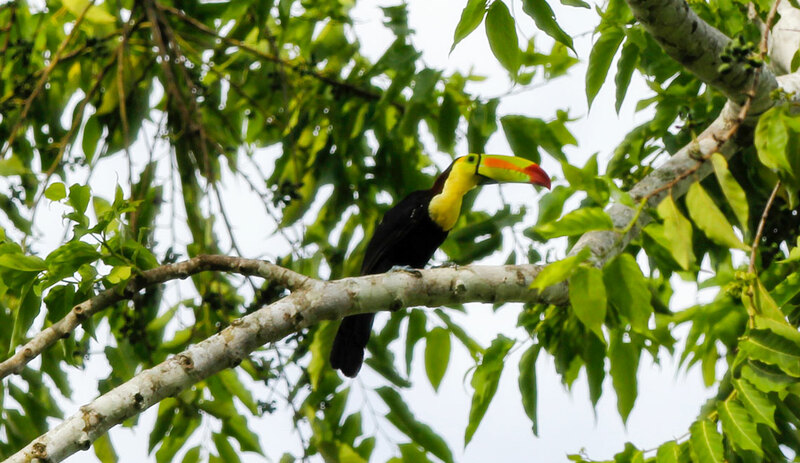 Woodpeckers, tragans, large parrots, the blue-crowned Mot Mot and to top it all: a Toucan! All in one hour, just walking around the resort grounds. They provided great equipment to use such as professional binoculars. In the afternoon our guide, Emiel showed us how big the nature reserve actually is during a 3 hour Naturalist Hiking tour. The resort has several trails. Our goal was to spot monkeys. 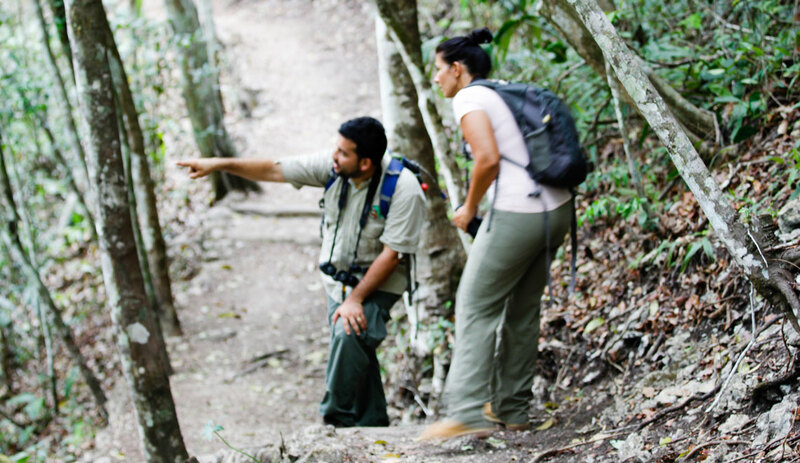 Our guide Emiel is very knowledgeable of the surrounding ecology, flora and fauna and the archaeological and cultural history of the area. It’s interesting to learn about how the Mayas made use of the plants and trees and how we nowadays still use them. After a short walk, we saw something moving in the treetops. And there they were: a bunch of howler monkeys in the trees. They were pretty relaxed and they came closer and closer and approached within about 10 feet. We were able to get some beautiful photos (see the one at the top of this article). After observing them closely for a while, we continued going up the trail. It led to the top of the mountain. Emiel told us about a recent Maya discovery. He showed us some odd-shaped hills on top of the mountain. 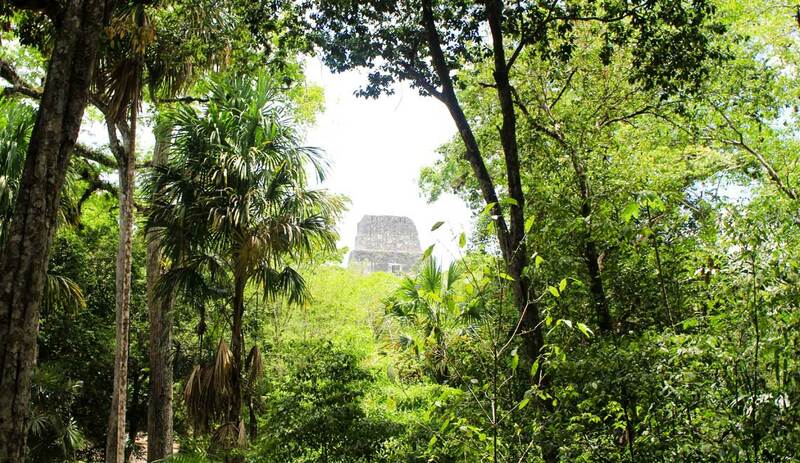 Under the sand and trees were ancient Maya Temples. Standing at the edge of the mountain we noticed we were quite high up. Emiel pointed out the top of the high temple of Xunantunich a couple of miles out. 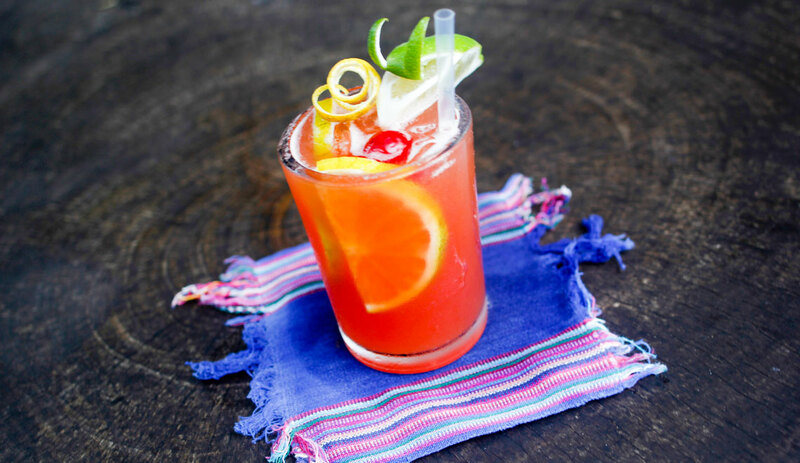 At the end of the day, it was time to relax with a nice cocktail! The bar’s cocktail selection is pretty impressive and they offer a wide selection of infused liqueurs, rums, and spirits. 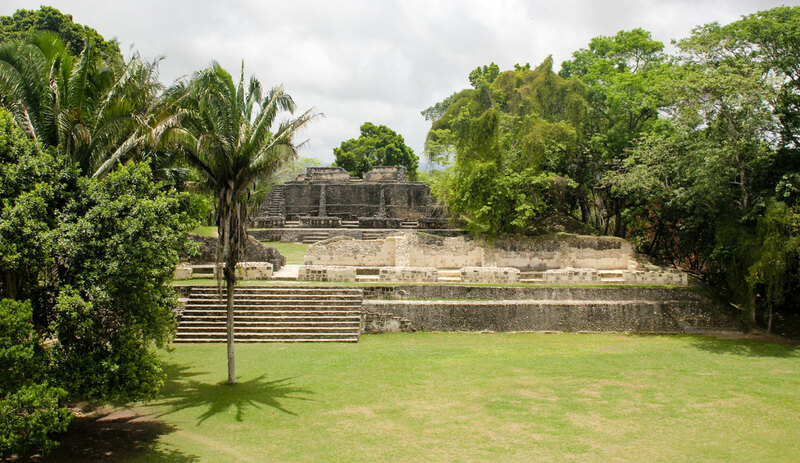 One of the most impressive Maya sites is just over the border in Guatemala, a 2-hour drive from Chaa Creek. The lovely ladies at the concierge desk at the Lodge were very convincing that Tikal is one of the most magnificent Maya sites. They arranged a day trip to Tikal for us to cross the border and have a tour guide to pick us up at the border. We were lucky nobody else booked the tour, so it was actually a private tour. Our tour guide was passionate about his work and just loved nature. The drive through Guatemala was spectacular. Tikal is immense and it would take about 3 days to see all the structures. Our guide knew the area like the back of his hand. He led us through the jungle instead of the more crowded roads. The sound of the jungle and wildlife surrounds you everywhere. Tikal is a place of wonder and amazement. The day wasn’t over yet! After dinner, we were invited to join the Creatures of the Night Walk. Our guide David provided us with a headlamp and we were off. The first creatures we spotted were hundreds of little wolf spiders. The coloured reflections in the grass were their eyes. It wouldn’t show up on a photo but they are everywhere! Most are just tiny and not so scary. 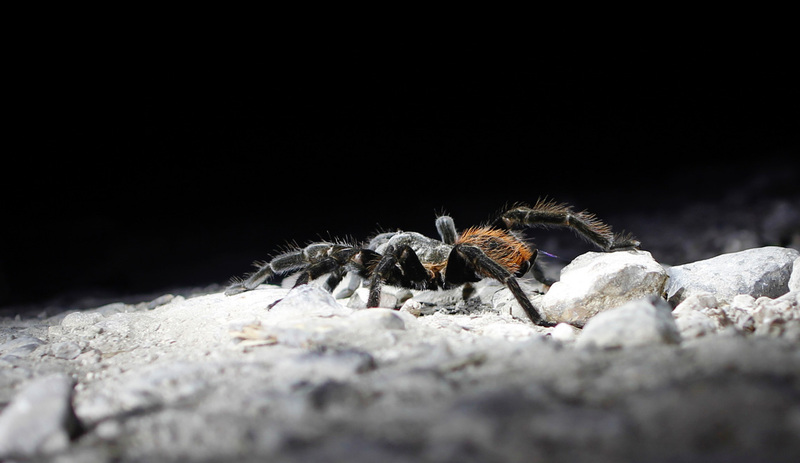 I then spotted the Red Mexican Tarantula, which hunts at night. 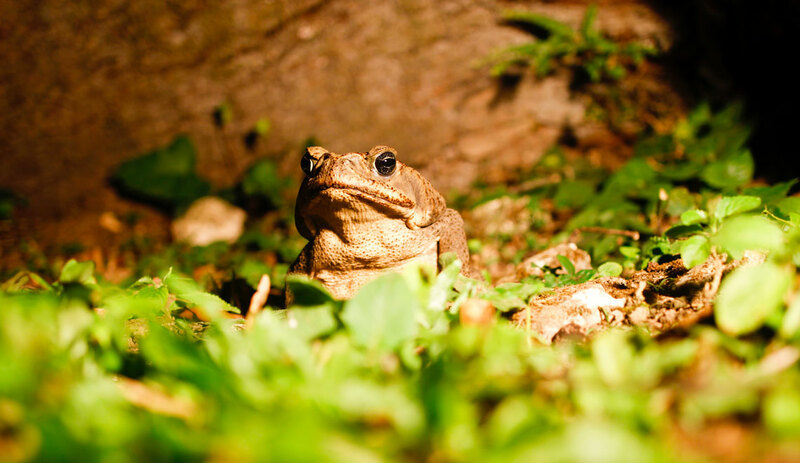 They can be found everywhere in Belize and they live in little holes in the ground. We have seen a couple in daylight but they are a lot more active at night in search of food. This was a bit scarier (for me), but I am getting much better around these kinds of animals. We went deeper into the jungle, wandering off the trails and spotted a Gray Fox, a Kinkajou high in the tree tops and an Opossum. At the end, we got treated to a sleeping iguana and a large Marine frog. We got lucky and were pretty satisfied with our findings. We had pretty spectacular weather until today. Xunantunich was on our program. We had a rental car and the drive was just 10 minutes from the Lodge. You do have to cross the Mopan river on a hand-cranked bridge, which is a bonus experience. This site isn’t as big as Tikal is. It is composed of six major plazas surrounded by temples and places. However, many archaeologists are working to excavate more structures and you really feel like you are discovering it with them. We planned to go kayaking upstream in the river but the rain spoiled those plans. Instead, we went to the Natural History Centre and got an informative tour. Afterwards, our guide there led us to the Butterfly Exhibit to learn more about these beautiful creatures. Not the greatest of all the activities, but still informative. After, again, a marvellous dinner, we went to bed early. We didn’t forget about our hairy friends in the tree next to us. They tend to start their day early… At 4am the howler monkeys went nuts for about 10 minutes. It was surreal, but we really felt we were right in the middle of the jungle. But then in a king size luxury bed! If you are wondering what the sound is in the middle of this video? Those were the Howler Monkey’s waking us up. The Lodge at Chaa Creek impressed me a lot. The way the staff treats its guests and the responsibility the Lodge takes to preserve nature and the surroundings. And of course, the way they help out the local community. I have the utmost respect for what they do. I think one extra day would have been great for one extra activity. After that, time to reflect on your adventures and relax on the islands. More information on the Lodge at Chaa Creek can be found on their website.